"The St Ives Society of Artists was formed in January 1927, as the artists then resident in St Ives felt that the art colony had become moribund. 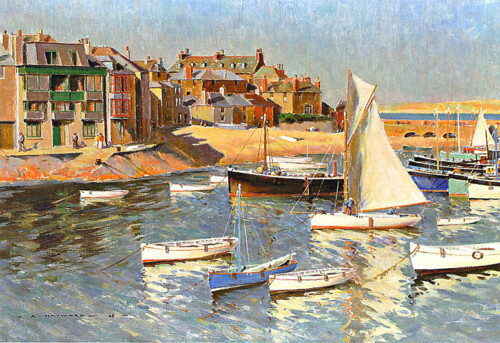 By offering honorary memberships to some of the leading artists that had lived and worked in St Ives in the past - such as the Royal Academicians Arnesby Brown, Julius Olsson, Adrian Stokes, Terrick Williams and Algernon Talmage - and to other well-known Cornish artists - such as Stanhope Forbes and Lamorna Birch - the quality of the Society’s Exhibitions was soon dramatically enhanced and considerable interest was aroused both in the press and amongst the public. In 1931, notwithstanding the Depression, the Society bravely took on the extra cost of launching a series of touring shows of Municipal Art Galleries around the country. This novel concept was phenomenally successful, with one tour in 1936 attracting an astonishing 75,000 visitors. As the fame of the Society spread, more and more artists who had lived, studied or merely visited Cornwall became members. Those who were or were to become Royal Academicians included Frank Brangwyn, Sydney Lee, Laura Knight, Stanley Spencer, Dod Procter and Bernard Fleetwood-Walker. During the 1930s, seventy or more works by members were regularly hung at the Royal Academy each year and, in 1938, this figure topped eighty. Borlase Smart, who was the master mind behind the Society’s development, in 1944 invited Ben Nicholson and Barbara Hepworth to join and the Society emerged from the difficult years of the War with a significant section of young artists keen to move away from traditional representational art. This group included Wilhelmina Barns-Graham, Peter Lanyon, Bryan Wynter and John Wells. More touring shows were organised, including a prestigious tour of South Africa in 1947, and the blend of traditional and modern work on display was considered of great interest. However, tensions arose between the older artists and the young moderns and, in 1949, amidst great acrimony, a number of artists resigned from the Society and went on to form the Penwith Society. Although the 1951 Festival of Britain Exhibition held by the Society was its most successful ever in terms of sales, the 1950s proved a difficult decade as art critics and subsequently the public ignored or lambasted representational art. The modernist artists were taken up by the Arts Council and their work was acquired by the Tate Gallery, who have subsequently promoted just this aspect of St Ives art. 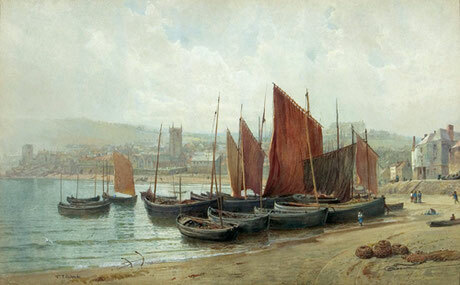 The representational artists, whose popular success did so much to restore the colony’s reputation and whose depictions of Cornish beauty spots had such a significant impact on tourism to Cornwall, have, until now, largely been ignored. There was no ‘Society style’ - the artists always priding themselves on their individuality - but many members might appropriately be termed ‘British Impressionists’. Although few artists embraced the move towards abstraction, innovative work was still produced. During the 1930s, there was an increasing concern with decorative pattern, influenced by Art Deco and the burgeoning Railway Poster market, in which many members - such as Leonard Richmond, John Littlejohns and Charles Pears - were leading designers. The St Ives Society of Artists, aided by strong leadership, innovative marketing and an extraordinary unity of purpose, was a successful, nationally acclaimed and immensely popular group of artists during its first quarter century. It is time for these artists to Create A Splash again!"